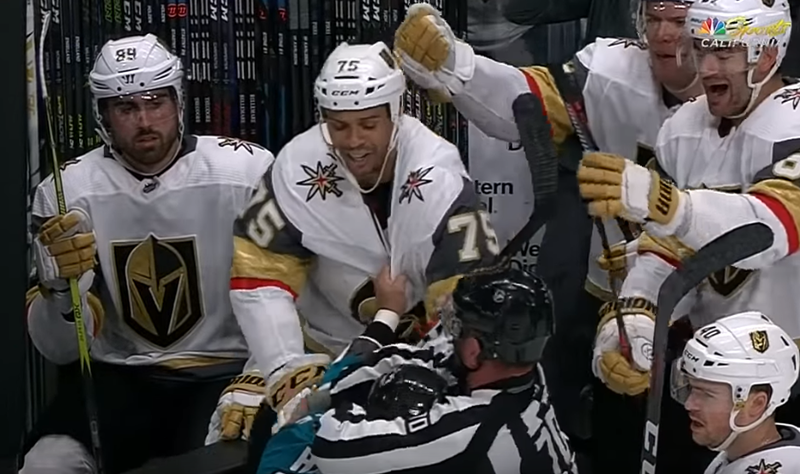 San Jose Sharks center Micheal Haley pulled Vegas Golden Knights center Ryan Reaves off the bench in an attempt to fight him during Monday night's game at the SAP Center. It happened in the first period with the Golden Knights holding a 3-2 lead. Reaves had just dished out a huge hit on Sharks right winger Micheal Karlsson before heading to the bench to end his shift. Even though the hit by Reaves was clean, Haley wasn't going to let Reaves skate away without sticking up for his teammate, even if he wasn't on the ice at that moment. Play was stopped as Haley grabbed Reaves by the jersey and landed a punch. Haley managed to pull Reaves through the bench door and onto the ice as a linesman was stepping in between the players to separate them. Haley was given two minutes for roughing and sent to the penalty box. Reaves and the Golden Knights won the game 7-3.